In recognition of Remembrance Day 2017, the Canada’s First World War series on ActiveHistory.ca is pleased to publish this article by Laura Brandon, a former curator and historian at the Canadian War Museum. In the year of the centennial of the Battle of Vimy Ridge, Brandon’s piece sheds light on the design and meaning of the enormous monument to that battle in France, which has done so much to keep Vimy, and Canada’s military history, in the imagination of Canadians since it was unveiled in 1936. Situated on top of the ridge that overlooks the Douai Plain in northeastern France, the Canadian National Vimy Memorial (1936) commemorates the tragic yet successful April 1917 Battle of Vimy Ridge. It is for many Canadians an important marker of their nationhood and identity. It is also a magnificent monument to Canadian sacrifice during the First World War (1914?1918). Losses were staggering. On the Western Front, one Canadian in seven who served was killed. Overall, more than 60,000 soldiers of the 600,000-strong Canadian Expeditionary Force were killed, which is more than in all of the wars, or military missions, Canada has fought since then. If the memorial on Vimy Ridge is Canada’s major international First World War monument, it is also the crowning achievement of its designer Walter Allward (1875-1955). By surveying some of its iconographic and artistic inspirations we can perhaps once again understand the monument as he first envisioned it. Freed from the inevitable accretions and losses of meaning that accompany eighty years of history, memory and politics, a number of the original denotations behind its multiple visual elements can be discerned. At the end of the First World War, an Imperial War Graves Commission committee (now the Commonwealth War Graves Commission) awarded Canada eight battle sites – three in France and five in Belgium – on which to construct memorials. In 1920, the newly established Canadian Battlefields Memorial Commission organized a competition for an identical Canadian memorial to be erected at each of these locations. Figurative sculpture, stated the competition guidelines, could be included in the monument’s design. The competition organizers clearly placed an importance on content and a narrative role beyond the symbolism of the sites alone. In October 1921, the commission announced that Allward’s design, which included twenty symbolic figures of virtues associated with war including Faith, Justice, Peace, and Hope, would be erected on a single site. Allward’s figures were to form an integral part of a planned massive stone platform surmounted by two soaring pylons representing Canada and France (one bears a maple leaf, the other a fleur-de-lis). The values the committee believed stood for the nation and its people at that point in time were clearly reinforced by Allward’s complex narrative. In the summer of 1922, the Canadian Battlefields Memorial Commission selected Vimy Ridge as the preferred site for Allward’s winning memorial. The seven other battle sites, with the exception of St. Julien, which acquired second place winner Frederick Clemesha’s (1876–1958) monument depicting a brooding soldier, made do with economic, strikingly plain, and allegory-free monuments. Certainly Vimy Ridge’s impressive location and vantage point as much as the battle’s military significance, contributed to its selection. Allward almost immediately began to sculpt the figurative elements in clay in a government-acquired studio in London. Studio assistants subsequently cast these in plaster. The plaster figures are approximately life-size but the completed stone figures on the actual memorial are twice as large. 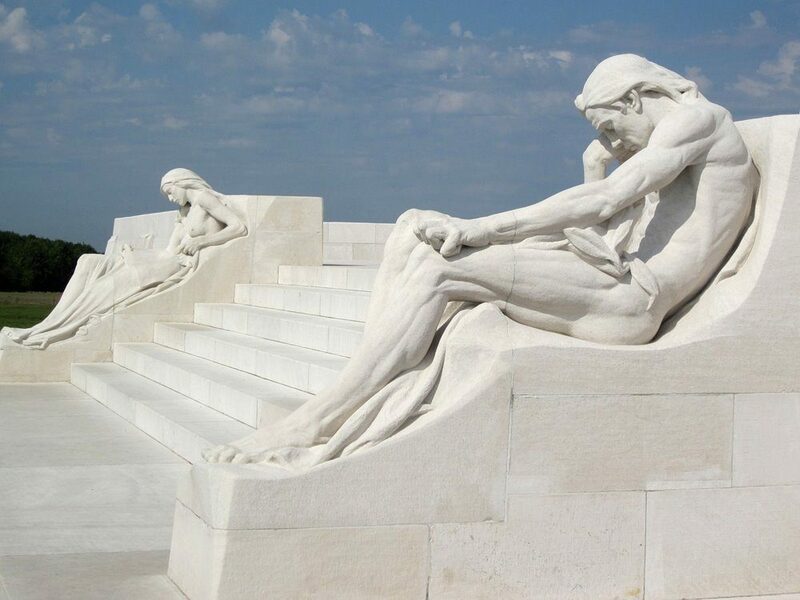 Franco-Belgian carvers at the Vimy site copied the plaster models in stone sourced from a quarry near Sarajevo, Yugoslavia, where, nearby, in 1914, the assassination of the Austrian Archduke Franz Ferdinand and his wife had precipitated the war’s outbreak. A well-respected Anglo-Italian sculptor, Luigi Rigamonti, who had lived near Allward in London when the latter was designing the monument, added the finishing touches. The First World War’s revived religious sensibility is important for understanding the monument’s iconography. Religion provided a useful and acceptable means for church and state to rationalize a conflict that, ironically, had undermined many of the fundamental tenets of Christianity. Throughout the war, the most important symbol conveying the idea that the slaughter was not senseless but redemptive was Christ’s crucifixion. Young Canadian soldiers could be personified as symbols of sacrifice and resurrection by equating their deaths with Christ’s on the cross. Allward is buried in an Anglican cemetery near where he lived, in Toronto, which suggests his interpretations were developed in the prevailing and predominant Christian mindset common to many of his generation, especially in the war years, which saw a resurgence in Christian practices. Certainly the significance of the battle’s occurrence at Easter was not lost to him and undoubtedly contributed to the memorial’s dominant crucifixion imagery. 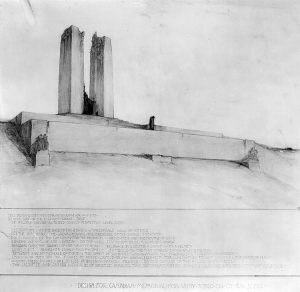 Nevertheless, if religion provided important intellectual scaffolding for the Vimy monument, Allward also incorporated secular emblematic material. By thoughtfully reworking this and Christian symbols, he was able to more deeply explore the meaning of sacrifice. As the memorial shows in its design, Allward consistently articulated sacrifice as a source of grief but also of hope. Fundamental to Christian belief is the concept of life after death, a view critical to understanding the memorial’s iconography. It is also reasonable to suppose that the nature and tone of Allward’s dream was influenced by the richly poetic language of his time; what Paul Fussell termed “High Diction,” in his 1975 book The Great War and Modern Memory. The unspeakable was written about in the most romantic and almost biblical of forms as the bereaved sought, through language, a means of understanding and commemorating the human cost of the war. As we shall see, however, if Allward found much to inspire him in Christianity he also found stimulus in the powerful romantic and symbolist art of the contemporary French sculptor, Auguste Rodin (1840–1917), and others. Allward defiantly identified himself as an artist. [iv] In innumerable photographs, he sports an artist’s beret. His artistic heroes were Rodin (also a beret-wearer) and Michelangelo. Indeed, in 1898, Allward honeymooned in Paris in order to familiarize himself with Rodin’s work. [v] The passion and energy the Frenchman expressed in his sculpture inspired Allward whose own early career was more prosaic. Born in Toronto in 1875, he trained first as a draughtsman and then as a sculptor. Along with significant memorial work that included the figure of Peace for the Toronto monument honouring the 1885 Northwest Resistance and the 1899–1902 South African War Memorial in Toronto, Allward earned a stellar reputation with his sculpted portrayals of famous Canadians such as Prime Minister Wilfrid Laurier. Allward’s figures owe elements of their design to classical models ? both original and copied. The acclaimed and much-reproduced statue of the Apollo Belvedere (350?325 BC) was one. This figure holds a gently twisted or contrapposto position, which Allward utilised effectively in many of his Vimy figures to add life and dynamism to the static stone he utilised. His use of richly pleated and folded drapery on his figures also has classical precedents, and is found also in the paintings of British Victorian painters undoubtedly familiar to him such as George Frederick Watts (1817?1904). Underlining Canadian interest in his work, Watts donated a drapery-infused version of his famous Time, Death and Judgement (c. 1865-1886) to the National Gallery of Canada in 1887. Watts was briefly married to acclaimed actress Ellen Terry (when she was only 16), whose later-born theatre-set designer son, Edward Gordon Craig, created geometric, clean-lined and unfussy modernist stagings in London that also appear to have proved inspirational in Allward’s design for the Vimy memorial. Allward had a number of celebrated and well-known British nineteenth-century historical memorial precedents to draw on as well, primarily those involving figures atop columns: Nelson’s Column in London’s Trafalgar Square (1840?1843), for example, which included symbolic materials and emblematic decorative detail. Like many of his generation of artists, Allward also sought inspiration in France where the often majestic and ornate nineteenth-century neo-classical Beaux-Arts tradition transposed to his home province inspired his predilection for groupings of allegorical statues as seen in his Northwest resistance and South African War memorials mentioned above. More importantly, at the same time he was designing the Vimy memorial, Toronto’s own preeminent Beaux-Arts building, Toronto’s Union Station (1914-1927), was nearing completion, a commission undoubtedly familiar to him. The abstractions associated with twentieth-century modernism also played a role in his Vimy design with its simple but imposing plain-faced vertical and horizontal elements. In his monument, Allward referenced the simple, unadorned grace of the British First World War Whitehall, London, Cenotaph (1920) designed by architect Edwin Lutyens (1869?1944). Also, the other notably minimalist and almost abstract elements Lutyens designed for the Imperial War Grave Commission cemeteries, such as the Stone of Remembrance (1917), had an influence. Allward’s own previous designs also feature in the Vimy memorial. Particularly evident are some of the figurative elements in Truth and Justice: Maquette for the Memorial to King Edward VII (c. 1912), which incorporates a tomb book-ended by allegorical sculptures of Truth and Justice, and is held at the National Gallery of Canada. Allward described the iconography of his intended creation in detail in his competition entry. If the finished design adheres closely to this description in many respects, by the time it was unveiled in 1936, he had expanded the memorial’s visual complexity and deepened its meaning as we shall see. In essence, the Vimy Memorial is a partially buried cross. The lower part of the vertical strut appears to be buried in the ground. Thus the figure of Sacrifice is placed as though stretched out like the crucified Christ on the arms of his cross. As such, the architecture evokes the many wayside calvaries that Canadian soldiers would have seen as they trudged backwards and forwards across the Western Front. As for the setting overall, designer Edward Gordon Craig’s crisp, clean, and powerful stage sets are reflected in the cross-arm, for example, which functions as a platform upon which the dead and the living symbolically act out the conflict’s contradictions and consequences. In reality, this is represented by the changing interrelationships formed by the memorial’s visitors and Allward’s figures as they literally turn from sacrifice to hope, as we shall see. Above, on the pylons, like participants in a Greek tragedy, a chorus of eight allegorical figures reinforces, echoes and amplifies the Allward-directed thinking originally envisioned for the memorial’s visitors. Centre-stage, her head draped, Canada personified as a woman, but depicted half naked to infer both her female and allegorical roles, looks down at the empty tomb below her. In her right hand she carries a bunch of laurel leaves, the symbol of victory and traditionally useful for warding off pestilence. [viii] Laurel is the leaf from which in classical times, the victor’s crown was made. Held not triumphantly aloft but upside down, the laurel leaves’ position emphasises the bitter cost of victory. In the bible story, it was women who discovered Christ’s empty tomb and in Christian symbolism, the empty tomb symbolises Christ’s resurrection. In Allward’s reworking, a single woman acknowledges the facts of death and of life after death. Simultaneously, this Watts-like female figure makes a clear reference to traditional Christian images of the Mater Dolorosa (Our Lady of Sorrows). Like the many post-war daughters, mothers, sisters, and widows, however, she has been left to mourn alone. Allward makes a direct reference to a line in Canadian Army Medical Corps officer Lieutenant-Colonel John McCrae’s famous 1915 poem “In Flanders Fields” in The Spirit of Sacrifice, who proudly holds aloft a flaming torch. “To you from failing hands we throw the torch, be yours to hold it high,” the line reads, reinforcing the message that a soldier’s death was not to be in vain. Some of the sculptural inspiration for this figure, pictured here in as Second World War publication derives from Allward’s knowledge of Rodin’s sculpture, perhaps the muscular man with his head thrown back known as the Falling Man (1882). The figure spread-eagled on the altar below the two pylons refers to the intended Sacrifice of Isaac at the hands of Abraham. This Old Testament story was commonly understood to prefigure Christ’s crucifixion and, as such, could also be interpreted in this setting as redemptive. Certainly, the fact that the figure stands on a fallen sword, the weapon a symbol of sacrifice in this context, reinforces the message that death is averted. In some respects, the position of the body, in particular the delicate contrapposto of its lower half echoes that of the Apollo Belvedere and other such sculptural precedents familiar to Allward, most likely through illustration. In the spread-eagled legs of two of the men and in the clasped arms of one of them, we see the influence of Rodin’s preparatory work for his celebrated monument to the French writer Honoré de Balzac (1799?1950). While the sword can be considered an emblem of sacrifice, here a third man breaks it suggesting the end of the sword’s association with death. The cross on the right-hand figure’s shield intimates that Christianity will still defend the post-sacrificial world. In an echo of the pylons’ two-nations’ symbolism, the image of the two men linked together hints that France and Canada will be at the new world’s forefront, working together. The small kneeling woman suggests a reversed version of Watts’ famous 1886 painting Hope, hugely popular for decades and, with its title, especially resonant in meaning in wartime. The other three figures convey the balance of the group narrative about the strong protecting and assisting the weak. Visitors first enter the monument at its rear. Here they see the reclining figures of the two mourners patterned on statues by Michelangelo in the Medici Tomb in Florence (1521?1524). The male mourner clasps a drooping laurel branch repeating the ambivalent relationship with victory that characterises the monument’s iconographic program. The female figure, seemingly exhausted, reads a Roll of Honour further underlining the idea that the cost of victory is hard to bear. The figures also derive artistically from the figure of Adam in Michelangelo’s Sistine Chapel fresco, The Creation of Adam (1511?1512) and from the Westminster Abbey monument to General James Wolfe (1772) by Joseph Wilton (1722?1803). It was here that a number of Canadian units deposited their colours (or flags) over the course of the First World War. Allward had previously used the figure of Adam in his Bell Monument in Brantford (1908?1917). Regardless of artistic origins, this is where visitors begin their participation in the rituals associated with death; joining with the stone mourners in acknowledging the war’s tragic human consequences as they move to the front of the memorial to gaze with Canada Bereft at the empty coffin below and the former battlefield beyond. Only by turning their back to this view can they see the symbolic figures that collectively suggest a hopeful future, as we shall see. The eight figures at the top of the pylons represent the universal virtues of charity, faith, honour, hope, justice, knowledge, peace, and truth. Truth and Knowledge are provided with the wings of angels, an attribute usually granted the figure of Victory, who is notably absent from the monument. In classical times, wings were an attribute of messengers of the gods. In Christian times, these figures evolved into angels or messengers of God. Allward is selective in his choice of virtues but all have their basis in Christian values. Notably, a majority of Allward’s figures are female. In antiquity, female subjects were utilised to personify abstract concepts, a device later taken up by the early Christian church. He also reworks the traditional attributes associated with classical and Christian virtues. Out of Allward’s eight pylon figures, three represent the principal theological Christian virtues: Faith, Hope, and Charity. Allward utilises only one of the Christian cardinal virtues: Justice, depicted as a man. In medieval Christian writing, Truth was associated with Justice and Peace, the latter also depicted by Allward. Many of his figures look heavenward, reinforcing the sculptural narrative’s Christian base. In modern times, Love often replaces Charity. In Allward’s rendition, however, Charity is the figure that most closely resembles Death in Watts’ Time, Death, and Judgement. In the painting, she collects buds, flowers, and withered leaves indicating an indiscriminate propensity to take the lives of all ages. In Allward’s version, it is poppies that this figure collects, a direct reference to McCrae’s poem and the new symbol of the war dead. Returning to Charity’s original meaning, however, it can be argued that she is also offering support, which the then newly-implemented Allied poppy campaigns were designed to achieve for veterans. With her halo manifesting a direct link with God, Faith is the most securely Christian virtue in Allward’s panoply. Her foot rests on a stone block representing her strong, unmoving foundation. Characteristically, she holds one hand to her breast. Her other arm is raised, the palm open. In pre-Christian times the open palm was regarded as a symbol of victory. For Christians, it symbolised the victory of faith and as such was viewed as particularly applicable to notions of sacrifice. A haloed Honour holds a scroll and looks upward. The inference is that she is sharing with God a list of those people who should be remembered for their brave actions. Hope, haloed, looks longingly upwards, her open left palm also pointing skyward denoting faith and hope. In Greek mythology, in the story of Pandora’s box, only Hope remained after evil (including war) was let loose in the world. In classical times, Justice regulated civilian society. Justice presided over the Silver Age of humankind, the second of four: Gold, Silver, Bronze and Iron. Each stage was progressively worse, but it was in the Silver Age that right from wrong was learned. A double-edged sword is the attribute of Justice. In Allward’s version, Justice holds such a sword but his head is bowed down in sorrow and the sword’s hilt hides his eyes. In the Renaissance, Justice’s blindfolding indicated an absence of judgement, a subtlety Allward perhaps intentionally implies in reference to war. A version of this figure stands outside Ottawa’s Supreme Court and is not blinded. Along with Truth, who is also present at the Supreme Court, these two figures were originally designed to flank Allward’s planned memorial to King Edward VII in Ottawa. Allward reworked Truth and her open book from the King Edward VII memorial design and her Supreme Court iteration into Knowledge on the Vimy memorial, adding wings. On the memorial, the book is closed and the figure’s head is bowed down, perhaps emblematic of the heavy weight of wartime knowledge he cannot bear to think about. Winged Truth is usually depicted wearing a laurel crown, which associates her with victory. Allward’s monument, however, only alludes to victory. Here, Truth contemplates a simple laurel branch and, as in Canada Bereft, only ambiguously implies the possibility of victory. The Canadian National Vimy Memorial took ten years to complete. It was not, however, entirely Allward’s vision by then. What the Canadian Battlefields Memorial Commission had not perhaps initially understood was the contribution that the public, as opposed to the artist, would make. Visitors increasingly came to identify the site as sacred to the overall memory of all those who died in the war, not just in France. They also came to understand it as a place where a sense of nation had been forged, a reaction that was not necessarily derived from the narrative inherent in Allward’s design. In responding to some of the public concerns, Allward made ongoing adjustments to the monument as construction continued. The loss of life, for example, he admitted had to be noted. It was for this reason that he was persuaded to engrave on the walls of the memorial itself the names of the 11,285 Canadian dead in France who have no known grave. However, by the time of the memorial’s unveiling in 1936, which was attended by over 100,000 visitors, veterans, and their families, the monument had become not only a focus for remembrance but also for peace. As one of the dominant interests in a period facing the rise of totalitarian regimes, peace was beginning to take equal place with the need to commemorate sacrifice. Any deeper understanding of Allward’s complex allegorical symbolism, with its origins in Christian iconography and the artistic influences of his day, was thus becoming relatively unimportant in the face of collective public need. By the time the memorial was unveiled, public response had ensured that his complex meanings had largely been subsumed into those that were important for the memorial’s viewers in their time and place, but not his. [i] This article is based on an evening lecture I gave at the Canadian War Museum in 2004, The Naked and the Dead: The Vimy Memorial Sculptures. In draws partially on material from my 2002 PhD thesis “The Canadian War Museum’s art collections as a site of meaning, memory, and identity in the twentieth century,” available online at: https://curve.carleton.ca/eff4ade7-bd9c-4db3-908b-54d4c6c3f4ba. [ii] See for example, Tim Cook, Vimy: The Battle and the Legend (London: Allen Lane, 2017) and Ian McKay and Jamie Swift, The Vimy Trap (Toronto: Between the Lines, 2017). [iii] Cited in McKay and Swift, The Vimy Trap, 151. [iv] For more on Allward’s life and career, see Lane Borstad, “Walter Allward: Sculptor and Architect of the Vimy Ridge Memorial,” Journal of the Society for the Study of Architecture in Canada [JSSAC] 33, 1 (2008), 23-38, available online at: dalspace.library.dal.ca/bitstream/handle/10222/65378/vol33_1_23_38.pdf?sequence=1 (Accessed 1 July 2017). [v] John Burge, “Walter Allward and Vimy, a service in stone,” Chapter Three in his Three Soldiers and their Ethos of Service (John Burge, 2016), available at: http://social-ethos.com/books/. For more on Allward see: Christine Boyanoski, “Walter Allward,” Canadian Encyclopedia, published 11 December 2008 [revised by Andrew McIntosh, 21 April, 2017], http://www.thecanadianencyclopedia.ca/en/article/walter-seymour-allward/; Jacqueline Hucker “‘After the Agony in Stony Places’: The Meaning and Significance of the Vimy Monument,” in Vimy Ridge: A Canadian Reassessment, Geoffrey Hayes, Andrew Iarocci, and Mike Bechthold, eds., (Wilfrid Laurier University Press, 2007); Dennis Duffy, “Complexity and Contradiction in Canadian Public Sculpture: The Case of Walter Allward,” The American Review of Canadian Studies 38, 2 (Summer 2008), 189-206. [vi] Quoted in John Pierce, “Constructing Memory: The Vimy Memorial,” Canadian Military History 1, 1 (1992), 6, available online at: http://scholars.wlu.ca/cgi/viewcontent.cgi?article=1111&context=cmh (Accessed 1 July 2017). For discussion of the monument focused on its place in Canadian culture, see Joan Coutu, “Re-inscribing a Monument: Vimy in the Canadian Consciousness,” Etude canadienne / Canadian Studies 80 (2016), 67-80. [vii] Alana M. Vincent, Making Memory Solid: Jewish and Christian Exporations in Monument, Narrative, and Liturgy (James Clarke & Co, 2014), 84. [viii] These leaves are sometimes referred to as lilies. At present, I am not convinced by this interpretation as lilies represent the triumph of life after death, a meaning that is important to the memorial’s iconography but one that is negated here by the leaves’ (not flowers’) downward trajectory. [ix] I hesitate to note the resemblance of these leaves to those carried upside down by Canada Bereft.